The Congolese government and international community should urgently reform the Congolese military and security sector, according to a newly released report spearheaded by the Eastern Congo Initiative and 12 other leading international and Congolese civil society groups, including the Enough project. The report, “Taking a Stand on Security Sector Reform,” is the product of extensive research and interviews in Congo and several donor countries. The groups urge the international community to strike a new collective pact with the Congolese government on security sector reform, or SSR. 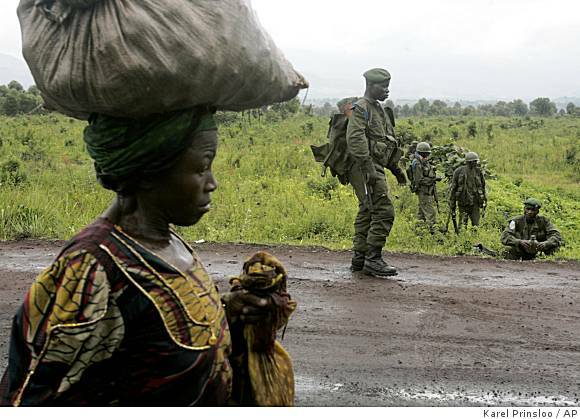 The international community has already invested billions in post-war transition in Congo. However, this investment has had little impact on improving the lives and well-being of ordinary Congolese. The central cause of this failed investment is rampant insecurity driven by systemic corruption and exploitation. The report highlights the lack of political will on the part of the Congolese government as the primary reason for the failure of army reform in Congo. Those government elites most reluctant to undertake meaningful security sector reform are those who have benefited from the endemic corruption. The combination of the lack of Congolese political will and inadequate and poorly coordinated assistance from the donor community has led to failed military reforms, both during the transition and after. Until now, international donor policy has been politically incoherent and poorly coordinated. New international engagement should be reinvigorated by including actors beyond the traditional donors. China, South Africa, and Angola, as well as regional bodies such as the A.U. and the Southern African Development Community, or SADC, also have vested interests in improving the Congolese security sector. The recent defection from the army of General Bosco Ntaganda highlights the need for security sector reform in Congo. The Ntaganda situation is a microcosm of larger issues surrounding security sector reform in the East and beyond. In comments relating to the crisis President Kabila acknowledged there are “hundreds” of reasons for Ntaganda to be arrested—three of which are International Criminal Court indictments. Moreover, President Kabila, as the leader of Congo, has the responsibility under international criminal law and the Congolese legal code to ensure the arrest of Ntaganda, as well as other gross violators of human rights, both inside and outside the formal military structures. With his statement, Kabila and his inner-circle are acknowledging that Ntaganda’s continued reign of impunity, and impunity writ large across the Congolese security sector, is not in the interest of the population of Congo. The establishment of an effective security sector is the fundamental step to meeting all other objectives, from ending the humanitarian crisis, preventing human rights abuses, encouraging investment and growth, stopping the trade in conflict minerals, and preventing regional tensions from escalating. Renew political commitment to SSR at the highest levels. Remove from office individuals obstructing military reform. Prosecute those guilty of human rights abuses and corruption. Launch a high-level forum on SSR made up of Congolese and international actors to develop the political will necessary for reform. Expand the Great Lakes Contact Group to include other key partners to improve donor coordination. Develop benchmarks for SSR progress, such as improved human rights record of military actors, and set benchmarks as conditions for financial support. Extend U.N. sanctions to those individuals impeding SSR. Empower MONUSCO to provide support for military reform and increase its SSR resources.